There was something both characteristically and uncharacteristically Miuccia Prada at Prada’s Fall 2017 menswear show during Milan Fashion Week back in January. 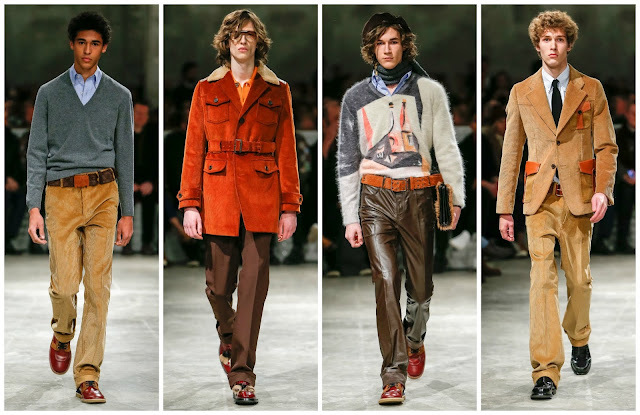 The show opened with a grey V-neck wool sweater, a crisp blue shirt, beige corduroys and rust round-toe shoes. The look was the basis of what you’re met with when you visit Prada concessions in most department stores and stores—a minimal amalgamation of basics that make up the majority of the company’s profits. It was also not typical of Prada—one expects to be met with a proposition of fizzing ideas with the opening look at a Prada show. Two things arose from that being the opening look. Firstly, was this proposition of normcore a sales pitch. Notably Prada’s sales dipped over the past few years with the luxury slowdown. Was this a message to shareholders that and the public that Prada will continue to do what it does best in this difficult time. Secondly, it points to Mrs Prada’s genius. This look could be interpreted as a perverse mockery of the state of the fashion industry. When ones watches a fashion show, one looks for brilliance and excitement. A grey jumper and slacks doesn’t exactly constitute vigour or exemplary fashion design. What is exemplary fashion design is becoming the very thing you’re mocking, and the conceptuality behind that. Low culture and normcore has dominated for many years and it is interesting to see Mrs Prada offering her two cents while simultaneously inhabiting the vulgarity of low culture and the simplistic nature of normcore. The collection didn’t jolt or provoke—uncharacteristically Prada—but it did offer utilitarian motions comprised of workwear staples that had been Prad-ified. There was a rust-hued leather jacket and abstract printed wool sweater that caught my attention. The wildest looks the runway saw were leather trousers. One didn’t even object to the prospect of men in leather trousers—realistically, most men wouldn’t be comfortable with the fabric on their pants but there was something desirable about these, in burgundy, midnight blue and pewter. The colour palette of the men’s show lent itself to the recent womenswear presentation. The rich colouration of the late 60s and 70s dominated this outing too. It was another example of the designer opting to manipulate and recreate thematic influences within each collection. Hitherto, Mrs Prada would’ve let each show be a disparate entity but nowadays her thoughts are percolating, she’s resting on ideas. Recently she explored travel for many seasons. Now, she’s preoccupied with our interpretations of masculinity and femininity. She is a talented menswear designer—credit where credit is due—but it doesn’t match the enormous success of her womenswear. Federico Fellini’s 1980 film City of Women was the inspiration for the show but Mrs Prada asserted that it was the title she was looking at, not the film’s content. The show space was decorated with posters of femme fatales. Mrs Prada world of women was a dimly lit universe. The collection felt self-referential—exploring the catalogue of one of the fashion industry’s most accomplished and talented creators. One thought of the feminist pop-art prints in the Spring 2014 collection—the Fellini prints of femme fatales on shift dresses conjured up that imagery; there were nods to Spring 2017 womenswear with the feather and fur fringed garments—here however traded delicacy for a harder edge; the nerdy, geek-chic sensibilities of Spring 2015 reappeared with distorted floral prints. It was an accumulation of ideas from recent years, a stratification of powerful fashion moments. Will it be the climax of the recent area with Mrs Prada ready to wipe the slate clean next season, and start afresh with modelling what the City of Women looks like to her. Maybe it all comes back to the intellectual veneer of Prada. Critics are frightened to criticise collections as they feel they just haven’t comprehended the message behind the clothing. Mrs Prada is an incredible designer, one with the capacity to continue to present the fashion industry with perverse commentaries on topics such as politics, feminism, normcore and channelling this through her clothing, whether that means corduroy trousers or checkered coat hemmed with clouds of white fur.